Toastmasters International is a world leader in communication and leadership development. Membership of 285,000+ strong, where individuals improve their speaking and leadership skills by attending one of the 13,500 Clubs in 117 countries that make up a global network of meeting locations. Toastmasters is one of the greatest investments you can make in yourself. At $36 every six months, it is also one of the most cost-effective skill-building tools available anywhere. We each have our unique story of how we found Toastmasters -- whether being told to attend by a boss -- dragged by a colleague or spouse -- or sought it out on our own. However we found our way to the meeting room, the important thing is, we FOUND it! Whether we were scared, overwhelmed or excited -- we faced our fears, introduced ourselves, responded to that first Table Topic question, presented our Icebreaker, accepted feedback -- and came back for more! Whether you are new to Toastmasters, or a seasoned member, you will enjoy, relate to and celebrate these genuine stories shared by fellow Toastmasters… sharing the passion, successes and gratitude of our membership. 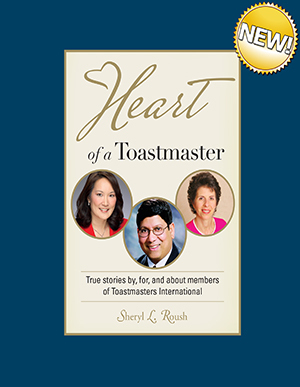 It's a honor to bring you this collection -- by, for and about our members -- The Heart of a Toastmaster. Discounts for 25 copies or more. Contact Sheryl Roush directly for special pricing.